Product prices and availability are accurate as of 2019-04-24 08:16:59 BST and are subject to change. Any price and availability information displayed on http://www.amazon.com/ at the time of purchase will apply to the purchase of this product. with its versatile design, this one-Piece Cimarron toilet matches a range of contemporary to classic decors. The elongated bowl and premium KOHLER toilet seat offer extra comfort, with seating at the height of a standard chair for ease of use. 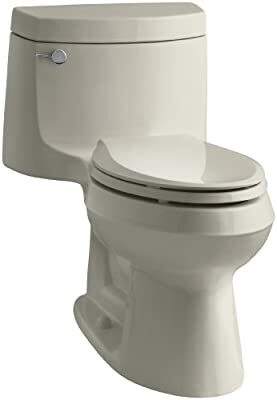 its 1.28-Gallon high-efficiency flush provides significant water savings up to 16,500-Gallon per year, versus an old 3.5-Gallon toilet, without sacrificing performance. Meets strict flushing performance guidelines established by the EPA's WaterSense program.^Qualifies as an HET(High-Efficiency Toilet). Consumer rebates are available in some municipalities.^Single-flush gravity uses the force of gravity and a precision-engineered tank, bowl, and trapway to create a strong siphon during flushing.^Light-touch canister flush requires a lower actuation force than a flapper.^Left-hand trip lever included.